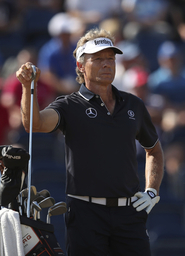 PHOENIX (AP) Bernhard Langer celebrated his fifth Charles Schwab Cup with his wife and friends, a glass of red wine in his hand. "There's not really much to say today about the round. It wasn't very good," McCarron said. "I couldn't quite get it going, but I was still hanging in there. I had a good opportunity at 10, just missed it. And I hit a poor tee shot on 11, which cost me a bogey. By then, I looked up and Vijay's at 21 or whatever he was at that point and it was like almost over." "I really didn't think I had any chance," Singh said. "The way they were scoring all week, I thought if I got to 20 (under), I might finish top 5," Singh said. "I birdied the first two, hit it close at 4. I just kept going. I didn't think about much. I didn't even know what we were shooting." "It doesn't get old," he said. "To look at the start of the year, if you would have said, `Hey, with nine holes to go, you had a chance to win the Schwab Cup,' I'd say, let's go, let's take it," McCarron said. "Unfortunately, I'm a little disappointed in the way I performed today."